Today one of the blogs I follow mentioned a food I haven't heard of in many years. Remember the egg in a basket? My grandma and mom made these for my little brother growing up. In case you've never heard of it, it's basically a cute fusion of an egg with toast. To be honest, I don't think my mom ever made this for me since I've always been a scrambled egg fan. They're really cool now that I think about it. Since I don't have any kids, I may need to make one for my husband -- he calls me the breakfast chef. Remember days when you had a tummy ache and Mom would make you something bland? The famous food for the sick, both at our house and at Grandma's, was Pastina. Maybe because we're Italian??? After I had my gall bladder removed, doctors said I could basically eat anything, as long as it wasn't fried. I didn't believe them, so I stuck to a bland diet for the first month. What was the first thing on my shopping list? Pastina of course. Make some and I promise you'll feel like you're three years old again. When I was five, my mom would make these awesome sandwiches that looked like happy faces. She would use olives or carrots as eyes and maybe a celery nose and half of a tomato slice for a mouth. Grandma would make us peanut butter and banana sandwiches. I made one the other day. It's not as tasty on whole grain wheat. Prior to the '90s, all of our sandwiches were served on white bread When it came to a standard sandwich, I preferred them cut diagonally or in quarters. Sometimes I still do this. Today while baking my final batch of Christmas cookies, I realized that I didn't make any of my family's old recipes. Honestly, I don't think I've ever liked the old family cookies very much. I'm not a fan of cookies with nuts, peanut butter cookies or those buttery spritz cookies squeezed from a special cookie gun. I noticed cookie guns are a very popular item on most wedding registries. Instead, this week I made boring Toll House chocolate chips (recipe taken right from the bag). Sugar Cookies ala Martha Stewart and Gingerbread cookies (recipe taken from the McCormick website -- they made my ginger, nutmeg and cinnamon. 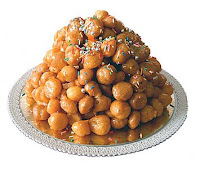 Another popular Christmas dessert my family loves is called Struffoli - they're honey balls. I can't stand them! They're sticky and just like these little little puffs of dry pastry. I think they're totally gross and it has nothing to do with who made them. 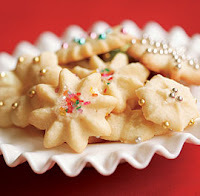 I've tried them at various holiday gatherings. I just don't think they're very tasty. As with most menu items, they're a hit with everyone, but me. Every Easter, my grandma would make several weird pies or breads. Another Italian specialty. One was a meat pie filled with bits of salami and other meats I don't particularly like. Obviously a favorite of everyone's. Grandma would dole out slices to my relatives. I passed on these funky pies. I'm so not a good Italian. Even looking at photos makes me feel a little ill. 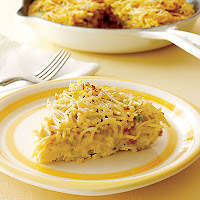 The other pie wasn't as bad, I think it was called spaghetti pie or spaghetti bread. It was basically spaghetti, egg, cheese and flour - it wasn't that bad, but I always thought it was a bit weird. The family loved it! Do you remember any weird dishes your family looked forward to every holiday? Are there any foods you loved as a child that you don't really eat much of today? As I write this, I'm craving an egg in a basket! Not a fan of soft yoke, I will have to fry it well. I'm sooo totally making this next time I make us breakfast! When I lived up in Canada there was this radio station that played vintage radio dramas. I quickly became addicted to it. They also played old radio commercials. One of the ads was for Velveeta and featured what they were hoping would be the next party snack. All it is, basically, is a slice of bread, with peanut butter, a pineapple slice, and a slice of Velveeta, all baked in an oven. Needless to say I had to try it. It's oddly good. It's not exactly Christmas food, but it was the first thing that came to mind. Of course I remember the egg in a basket...but my mom just called it "egg toast." Go figure. On special occasions my mother would make Tomato Aspic (I think that's how it's spelled). It was like Jello made out of tomato juice. YUCK! I've never liked tomato juice and I don't eat Jello because of the way it wiggles. I don't like my food to move. Oh yeah, I've eaten all of the above. I make the eggs in a basket for myself every once in a while. 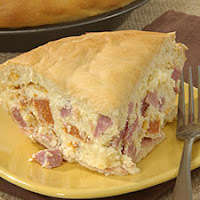 But I LOVE the Easter meat pie ("pizzagain," as they call it). My mother-in-law makes it. I'd never had it before I met my husband, but it's delicious! @RDS - yes! You're right "pizzagain" that's what it's called. Ha ha! So funny! TS - that snack sounds so gross. Ick! Cheese and peanut butter and pineapple? 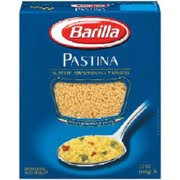 mmm Pastina! when i had a sore throat, either real or pretend, my Mom would mix up honey and lemon. so tasty! I feel like I should be leaving a great comment here and why can't I think of anything good? Mincemeat tarts, 'cause I'm Irish already...and NO it's not meat, it's many different type of fruit! Sweet & Sour meatballs for New Years Eve...no, they're NOT Irish, we just like'em! Merry Christmas & A Blogging Great 2010! I am Italian and I nothing makes me feel better then having pelenta when I am sick. I thought i was the only one! Oh and go eggs in a basket- they rock!